The Mets entered the World Series as big favorites, having won 108 games during the regular season. Those 108 wins did them little good in Game 1, however, as Red Sox starter Bruce Hurst pitched eight scoreless innings, and Boston took the opener 1-0 on an unearned run. Game 2 matched 1985 National League Cy Young winner Dwight Gooden against 1986 American League Cy Young winner Roger Clemens, but neither ace lasted more than five innings. Boston's bullpen proved stronger than New York's, the Sox took a two-games-to-none edge with a convincing 9-3 victory, and the Series shifted to Fenway Park. Undaunted, the Mets got on the board with a 7-1 decision in Game 3, thanks to four runs in the first inning and seven strong frames from starter Bob Ojeda (who had pitched for Boston in 1985). The Mets made it two straight in Game 4. 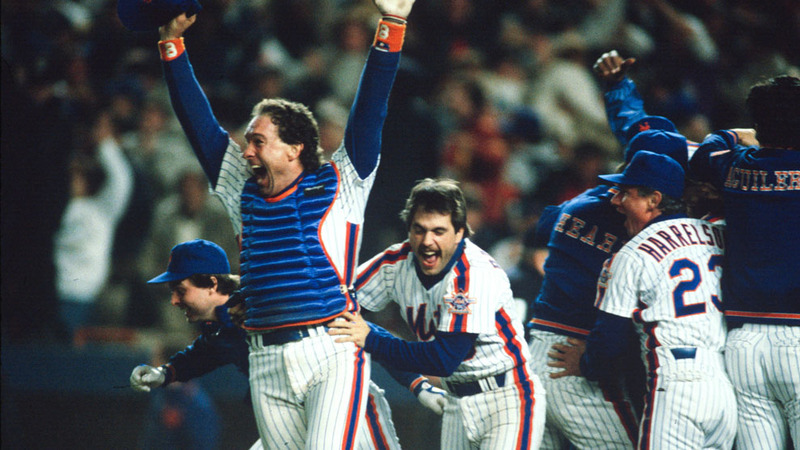 Catcher Gary Carter smashed a pair of home runs and a double, Lenny Dykstra homered off the glove of Sox right fielder Dwight Evans, and the Mets rolled, 6-2. In Game 5, Bruce Hurst again frustrated the Mets, allowing 10 hits but just two runs while the going the distance. Gooden, meanwhile, couldn't escape the fifth inning and took the 4-2 loss. So with the Series shifting back to Shea Stadium, the Red Sox needed just one victory to end their 68-year championship drought. Clemens pitched well, but so did Ojeda, and after nine innings the game was deadlocked, 3-3. Boston's Dave Henderson led off the 10th with a home run, and a few minutes later Wade Boggs scored on Marty Barrett's single to give the Sox a 5-3 lead. The Curse of the Bambino, it seemed, was about to be lifted, especially when Calvin Schiraldi retired the first two Met hitters in the bottom of the 10th. But then came three straight singles, and it was 5-4. Sox manager John McNamara summoned Bob Stanley from the bullpen, and Stanley promptly threw a wild pitch that tied the game. Then, on a full count, Mookie Wilson grounded a ball right to first baseman Bill Buckner. And in a scene that will never be forgotten by Fenway faithful, the ball scooted straight through Buckner's legs while Ray Knight scored the winning run. Demoralized or not, the Red Sox grabbed a 3-0 lead in the second inning of Game 7, thanks to a pair of solo homers from Dwight Evans and Rich Gedman. The Mets came back and tied the game with three runs in the sixth, and went ahead for good with three more in the seventh off Schiraldi. Mets lefty Jesse Orosco finished off the Sox with two perfect innings of relief, and the Mets were champions.